Other than the regulation “high and tight” there is nothing about Marines that sets us apart from anyone, and even that “high and tight” isn’t so special. No there is nothing about Marines that makes us different, except of course the things that do. If you were so unfortunate as to meet the typical Marine “Boot private”, one who had just marched off of the parade ground of Parris Island, or a Hollywood Marine of Marine Corp Recruit Depot San Diego, you would typically be gazing at an eighteen year old, unimpressive kid who looked like he or she had been starved, tortured, forced into hard labor in an internment camp, emotionally abused, psychologically broken, and is possibly suffering from Stockholm Syndrome. In fact, your prejudice would be accurate. You would observe with concern, the kid’s awkward gate, as he or she drove glassy Corfram heels menacingly through the pavement as if momentum itself relied on the violence. If you approached and asked if the kid was okay, concerned that this kid may have Asperger’s, your concern would be validated by a series of staccato, louder than necessary responses, that would be limited to: “yes”, “no”, “Sir”, or “Ma’am”. The kid would stand uncomfortably, ramrod straight with arms pinned at the trouser seams. You would be polite, and walk away, not knowing what to think until someone later informs you that what you saw was a newly-minted Marine. You would say okay, scratch your head, and most likely share your incredulity. You had expected that a Marine would be more impressive, majestic, menacing even, but that…that was just weird. Fast-forward a few months to a second encounter and you would witness a transformation of sorts, not that it still wouldn’t be weird, just less Asperger’sy and more Turrets. The short and polite remarks would almost entirely be replaced by cursing, more cursing, and when not cursing, inappropriately sexual language, that would make Beelzebub himself wash his mouth with soap. The humility sensed during your first encounter would have been discarded long ago, replaced by an unbelievably, irrational braggadocio, which would border on the insane. (The only other place where this behavioral dysfunction is notable is among New England Patriots fans. Go Pats!) Your eyes would still gaze upon the same unimpressive looking kid, who now displays a grotesquely large wad of tobacco protruding from the bottom lip. What could have caused this metamorphosis? Is he even really a Marine? 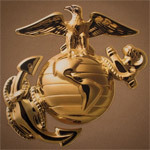 Marines are supposed to be lionhearted warriors of lore, apex predators whose power is obvious, whose respect is immediately earned, like a pack of wolves or a pride of lions, but there is no awe or menace here. This is where you would finally be wrong. The Marine totem is not a lion, a wolf, or even, (please forgive me Archibald Henderson, Smedley Butler, and Chesty Puller, for I am about to blaspheme), the bulldog. No, the Marine totem is a creature of lower station than all of those and one which would hardly strike fear in anyone. I speak of the grasshopper, the locust to be more precise. The grasshopper, by itself, is well, unimpressive, annoying to listen to, but mostly harmless. However, when the right conditions arise (the Marine Corps ensures that they arise regularly) and the grasshoppers find themselves to be in high enough concentrations, and there is a scarcity of water and food, be prepared, for something wicked this way comes. The grasshoppers begin a serotonin induced transformation into a swarm of locusts whose voracious appetite for destruction lays waste to anything in its path. It is a power so abhorrent that it is mythologized, as Plague, in the Torah, Bible, Quran, and further in antiquity. It is a fate so morbid that it is only unleashed on the most recalcitrant evil. And it is there, in the aftermath, when awe, fear, and respect, is earned for these loathsome, little creatures.